Photographing weddings is always telling the story of the beginning of a family; but what about when the family is already more than two? Involving the children of the wedding couple is important to us because they're an integral part of the story. 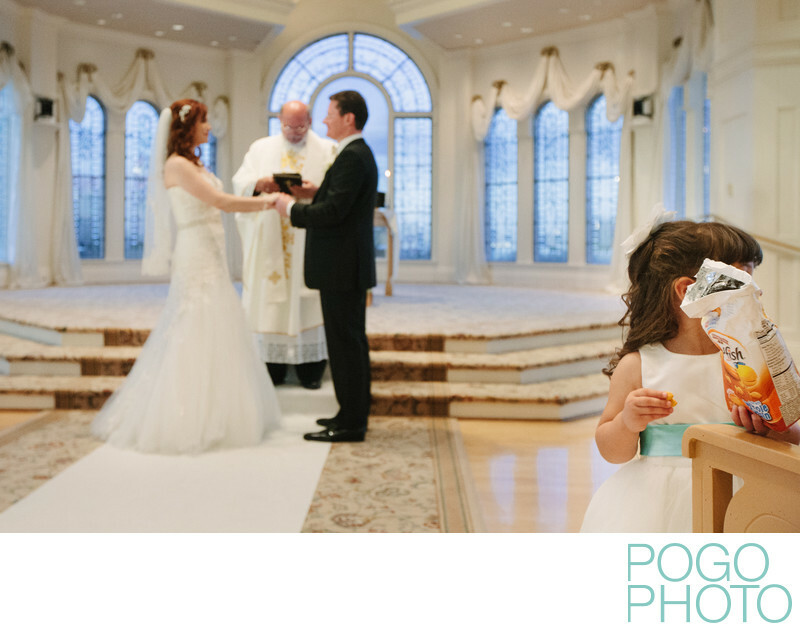 While posed, smiling images of kids at weddings are expected, ideally we want to get to know them well enough that they ignore us and our huge cameras. It helps for us to meet everyone involved ahead of time, particularly if the children are young; this allows us to create images such as this one, which is one of the most genuine three-year-old photos we've taken. Parents getting married? No big deal. There are goldfish to be eaten. On a related note, involving children in weddings can bring a wonderful, innocent, and joyful theme to the celebration, but it helps to remember that despite the importance of the day, young kids and even tweens aren't often willing or able to grasp that their actions can be detrimental to the process. Working with this concept, instead of against it, is paramount. Realizing that your children are likely to still behave like children can lift a great weight from the stress of controlling every part of the timeline! We recommend having a childcare professional, an extended relative, or both to help wrangle any kids, but remember that even under the best case scenario they will still need their parents from time to time. Weddings are not the time to practice restraint or discipline; to a certain degree normalcy should be maintained, but an extra treat or some time with a favorite toy or media device isn't going to derail years of parenting entirely, and may very well keep everyone involved happier. After all, adults make exceptions for weddings for themselves: a few extra bites of something delicious, an extra drink or three, a new pair of shoes. Letting kids be themselves and also realize that weddings are special occasions can be a great learning experience. Location: The Wedding Pavillon at The Grand Floridian, 4401 Floridian Way, Bay Lake, Florida 34747. 1/200; f/4.0; ISO 1600; 35.0 mm.